Elaine Kosnac has been sewing since the 1950’s. 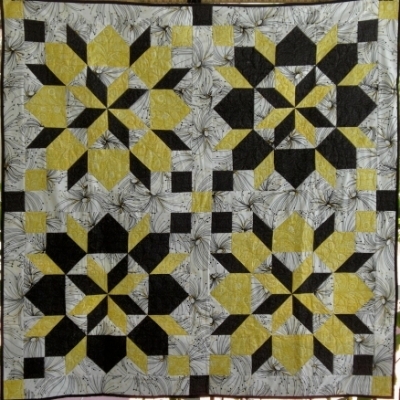 She formed her quilt pattern company, Quilter’s Nook Studio, after her quilting co-workers encouraged her to try quilting. We took some time to chat with Elaine about her patterns and best tips. QNS: I’ve been a sewer since the 1950’s. By 7th grade, I was making all of my own school clothes. Fast forward 25 years and I found myself working the stock room for a fabric chain store. The gals on the floor all quilted & encouraged me to give it a whirl. At that time, I leaned towards the camp of “why cut up that beautiful fabric into tiny pieces & then sew it back together again?” For my first project I thought, “What could be easier to make than a single shape quilt?” So I chose to make a 1000’s of Pyramids, in a queen size! Back then we were working with a lot of polyester and polyester blend fabrics – what a nightmare! I quilted it on a domestic (old Kenmore) machine. Even with all the issues, and believe me there were many – I was hooked! 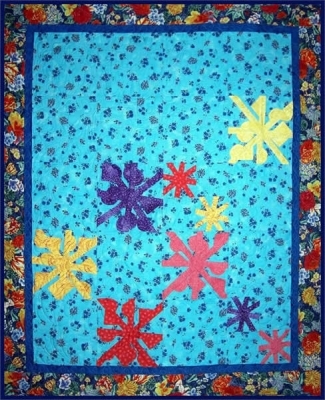 QW.com: What are your favorite quilting patterns and why? QNS: Over the last 14 years of having a brick & mortar store, quilting studio and teaching, I have found that patterns that appear to be complicated (either by design or fabric choice), but really aren’t, truly build enthusiasm & confidence in every quilter, no matter their skill level. QW.com: What is your favorite part of the quilting process and why? 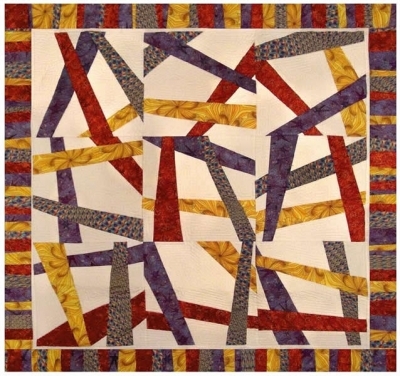 QNS: Currently, I am enjoying long arm free motion quilting, especially when my customer allows me free reign to get creative with the quilting. Since I don’t use pantos and my machine is not computerized (by choice), my creativity just blossoms. QW.com: You have a great skill for choosing fabrics for patterns. What advice would you give our readers about picking out fabrics? QNS: Sometimes the fabric is the inspiration for a quilt. Sometimes it’s the pattern that initiates the hunt for the perfect fabrics! Work with colors, patterns and styles that excite you! If you don’t like what you’re working on, it becomes a chore and then it takes forever to get it finished. If after you have your fabrics, while you’re starting to work on the project, if some of your choices really aren’t working, don’t be afraid to change them out. After all, it is your quilt! I feel that done is better than perfect & never finished. QNS: I think it all goes back to the old saying that if you value something, you find the time for it –even if it’s only a short time. Due to my current commitments, I can only block out three hours on Sunday afternoons for things that make me happy. It’s amazing how I look forward to that time each week, planning what I’ll do with it! Sometimes it has nothing to do with quilting – like painting the kitchen – but as long as it’s something that makes me happy, that energizes me for the rest of my week! QNS: Have as many multi-purpose rulers, templates, etc. as you find useful. Single purpose items that might get used only once, waste space and money. QNS: Since moving to the south I am learning how to garden all over again! But that’s ok. In the evenings, while keeping my Mom company, I find myself crocheting prayer shawls, or knitting socks and finger-less gloves for the grand kids back north. 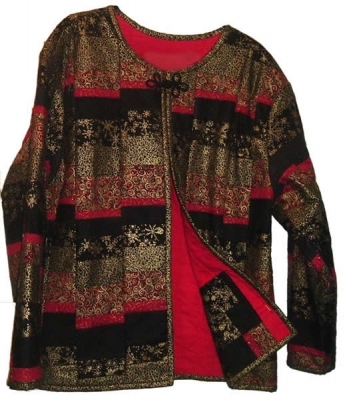 To learn more about Elaine and Quilter’s Nook Studio, visit her pattern page at QuiltWoman.com or website. This entry was posted in Designers, Helpful Tips, QuiltWoman and tagged Elaine Kosnac, Quilters Nook Studio, quiltwoman.com quilt patterns. Bookmark the permalink.